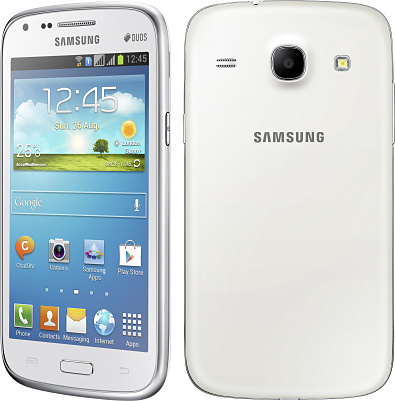 It's YASAS time again - or, Yet Another Samsung Android Smartphone. Samsung's latest launch is the Samsung Galaxy Core which sits in the tiny gap between the Samsung Galaxy S III Mini and the Galaxy S II Plus. What we have here is a dual-SIM or single-SIM Android 4.1 smartphone with a 4.3" 480 x 800 pixel display, a 5 megapixel primary camera and 0.3 megapixel video calling camera, a dual-core 1.2GHz CPU with 1GB of RAM plus all the usual features that you'd find in a Samsung smartphone like this. Internal flash memory is a modest 8GB with a microSD slot included. Possibly the only thing of note is the relatively large 1800 mAh battery which is somewhat bigger than most other Samsungs in the similar price range. There's an FM radio which is good, but the 5 megapixel camera on the back isn't HD capable when it comes to video recording and maxes out at a fairly unimpressive 480p instead. If for some reason this particular Samsung takes your fancy when all the other pretty similar ones don't, then you should be able to get the dual-SIM version from May or the single-SIM version from July depending on market. 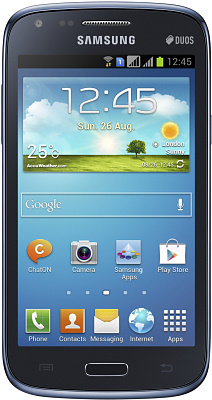 No guidance was given on price, but we would expect to see the Galaxy Core to retail for around €250 SIM-free.